Goodwill for Fashion: Who knew? The happening will feature a number of fashion experts in the Sacramento area, and welcome men, women, and children to get their fashion groove on. Stylists will pre-select clothing items for people of all sizes, and other items will also be showcased. During the event, guests will be able to browse “style stations” where stylists will offer personalized fashion advice. This is Goodwill’s second stylists event in the Sacramento area. The first one, held on April 28, was a rousing success. In the process, Goodwill attracts new shoppers to its organization by pointing out how people can, through a little hunting, acquire amazingly inexpensive ways to enhance their wardrobe. While Style with a Purpose is designed to be a fun event, it supports a serious cause. Each purchase to Goodwill helps improve lives of people who use the organization’s services. All purchases of merchandise from Goodwill’s stores benefit the nonprofit’s mission of helping people with disadvantages achieve self-sufficiency. In 2018 alone Goodwill Sacramento Valley and Northern Nevada provided more than $20 million worth of resources to those in need. Some community organizations benefitted are Next Move Homeless Services, Francis House Center, Wind Youth Services, People of Progress, and Community Link Capital Region. “Our business wouldn’t be possible without donations from our community,” Pearson asserts. What’s more, Goodwill is instrumental in helping people in the community rebuild their lives with its job assistance programs. Goodwill Industries gets results. In 2017, more than 38.6 million people utilized in-person and technological services from the organization to build their professional lives. Also last year, the organization’s Good Neighbor program, which provides emergency assistance on a referral basis to agency clients, directly served 72,937 people across 35 countries. Appleton added that the reduced monetary investment in clothing bought from Goodwill lends itself to experimentation. A recreational fashion designer can feel free to take the scissors to alter a Goodwill garment, because it didn’t cost a lot of money. “There’s no harm in doing a little DIY with Goodwill pieces. You don’t have a lot invested in them to make them unique and fit you.” Appleton was awarded Goodwill of Middle Tennessee’s 2016 Ambassador of the Year. Donaldson will serve as a stylist for the event along with Caitlin Alfstad, Dev Anglin, Hagen, Keia Mae, Tuyen, Vince Vicari, and Xochitl. Each stylist in the event will be on hand to provide personalized fashion advice. All attendees will be welcome to pick the brains of these local “bloggers, artists, and fashionistas,” as described by Donaldson. 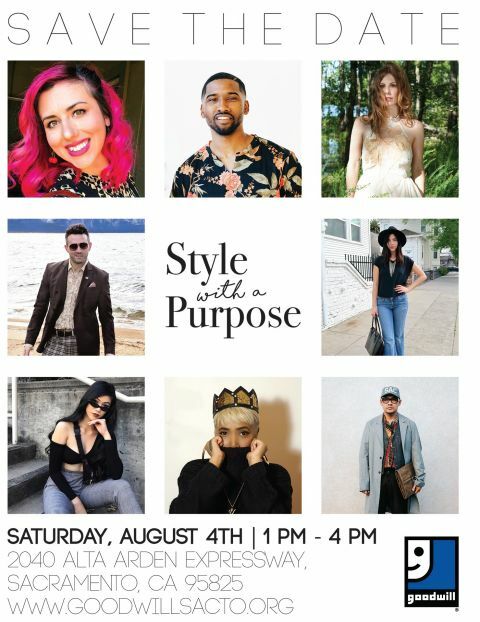 Style with a Purpose will take place on Saturday, August 4, at the Alta Arden Goodwill location, on 2040 Alta Arden Expressway, from 1-4 PM. Light bites and beverages will be served. For more information about Goodwill in this area, go to www.goodwillsacto.org.